As a companion to the Bicycle Friendly Community Program the League of American Bicyclists announced their rankings on Bicycle Friendly States which focuses on policies, laws, funding and implementation on the state level. Surprisingly New Jersey ranked 9th while more predictably Delaware and Pennsylvania ranked 31st and 38th respectively. New Jersey was given praise for it's dedicated bike funding (albeit a paltry $4 million), a statewide mountain bike plan, a hands free cell phone law and an exemplary Safe Routes to Schools program. Also at the Bike Summit League Executive Director Andy Clarke announced that Seattle made it's debut on the Bicycle Friendly Community with a Gold rating. 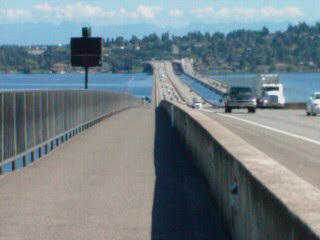 Looking at the pathway on the floating I-90 Pontoon Bridge on Lake Washington between Seattle and Mercer Island, WA.